In a letter dated February 26, 2014, His Beatitude, Metropolitan Tikhon, offered congratulations to His Eminence, Metropolitan Onufry of Chernovtsi and Bucovina upon his appointment as Locum Tenens of the Kyiv Metropolitan See in light of the declining health of His Beatitude, Metropolitan Volodymyr of Kyiv and All Ukraine. The text of the letter appears below. By way of background, the Holy Synod of the Ukrainian Orthodox Church held an extraordinary meeting at the Monastery of the Caves in Kyiv on February 24, 2014. 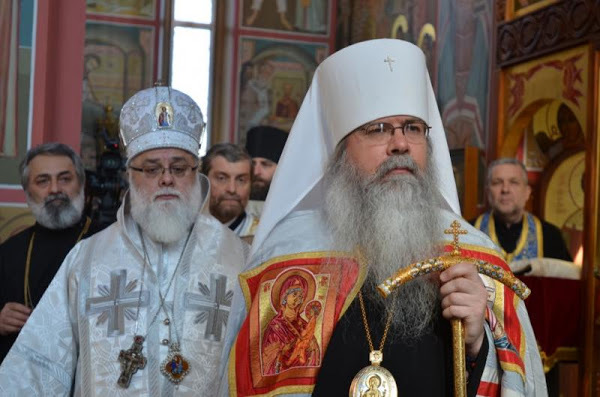 In accordance with the Charter of the Ukrainian Orthodox Church, His Eminence, Metropolitan Agafangel of Odessa and Izmail, the most senior permanent member of the Synod, chaired the meeting. His Eminence, Metropolitan Alexander of Pereyaslav-Khmelnitsky, who is responsible to the Holy Synod for overseeing the medical condition of Metropolitan Volodymyr, reported that due to ongoing health issues, Metropolitan Volodymyr was unable to perform his duties as Primate of the Ukrainian Orthodox Church. In a secret ballot, the Holy Synod elected Metropolitan Onufry to the post of Locum Tenens of the Metropolitan See of Kyiv. Metropolitan Onufry then presided over a session of the Holy Synod of the Ukrainian Orthodox Church, during which the hierarchs requested that the names of Metropolitan Volodymyr and Metropolitan Onufriy be commemorated during all divine services. We continue to offer prayers for His Beatitude Metropolitan Volodymyr, our beloved brother and concelebrant, and we stand by him with love at this painful time of his life and earthly pilgrimage. In the Orthodox Church in America we have prayed during the past weeks for the peace of Ukraine and its people and for the faithful ministry of the Ukrainian Orthodox Church in the midst of social and political turbulence and human tragedy. May God grant Your Eminence, and under Your leadership the whole Ukrainian Orthodox Church, the strength and wisdom to be a steadfast witnesses to social and ecclesial peace. In this way You will make an important contribution to the quest of the Ukrainian people for a humane life on the basis of mutual respect. Asking for Your prayers, I assure You of the prayers of the bishops, clergy, monastics, and laity of the Orthodox Church in America.